Get organized with this functional monitor arm for two monitors. The integrated gas spring makes it easy to adjust this model for optimal ergonomic comfort without the use of tools. The perfect solution for workspaces where you need two screens. Adjustable to different heights to fit different environments and individual needs. A practical and space-saving solution that fits most desks and screens. Can be adjusted with one hand and is easy to install on the table top with desk clamp or grommet mount. 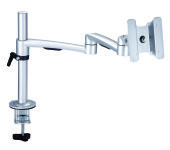 Ergonomic features: Ergonomic design and height-adjustable mount are perfect for a comfortable working space Increase viewing comfort and help reduce eye, back and neck strain Gas Spring assisted arm helps easy adjustment for viewing comfort Easy to mount on the tabletop. Can be operated with one hand. Adjustable without tools. 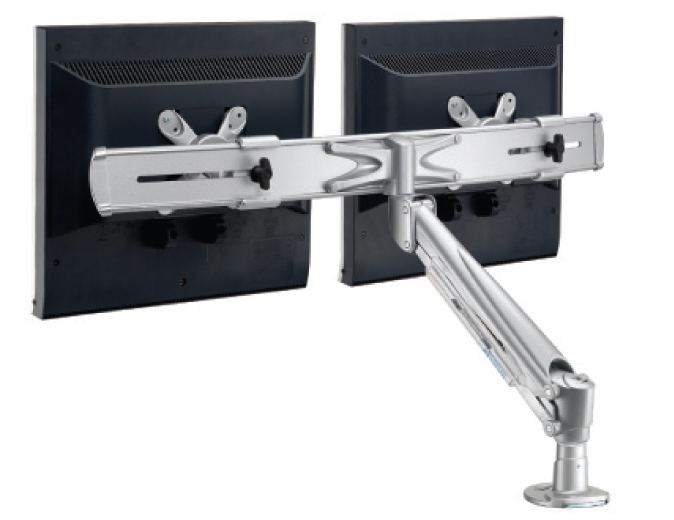 Height-adjustable Width-adjustable Cable management feature, routes cables under the arm and out of the way Monitor mounting Standards: VESA 100/75, (hole pattern: 100 x 100 mm & 75 x 75 mm) Weight Capacity 8~15 kg.